I’m having the glory of matching almost the same white shades. It’s actually quiete strange that there are so many different shades of white when it cames to clothes. While my jeans are in the warm white side I usually have cold/blueish white t-shirts. 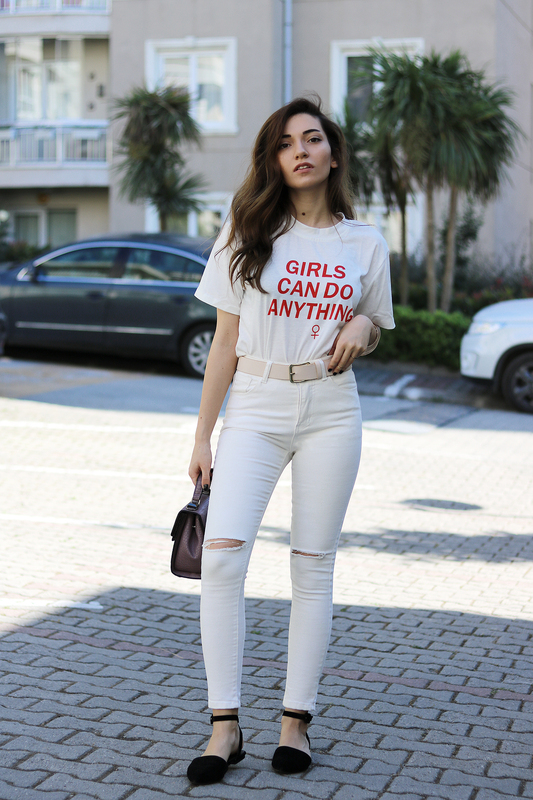 So it’s hard to create a total white look with this jeans but I love their fit and thick material thence it’s worth it. 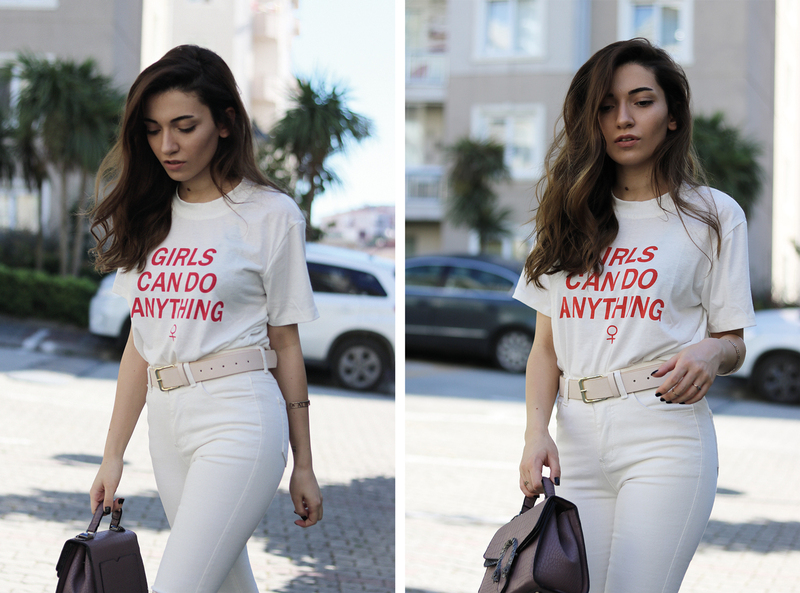 I feel very proud when I found this almost off-white t-shirt on Romwe.com. 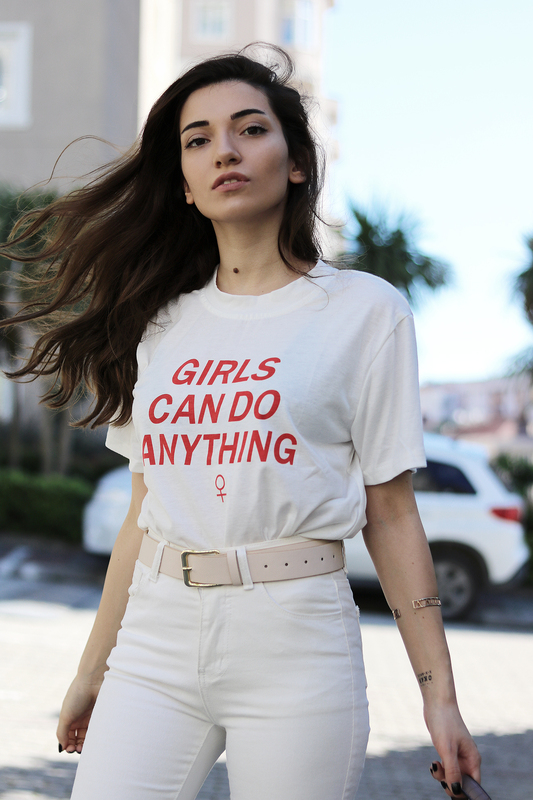 Besides the colors (well, technically white is not a color) I have a collection of feminist t-shirts which is I’m so proud of. 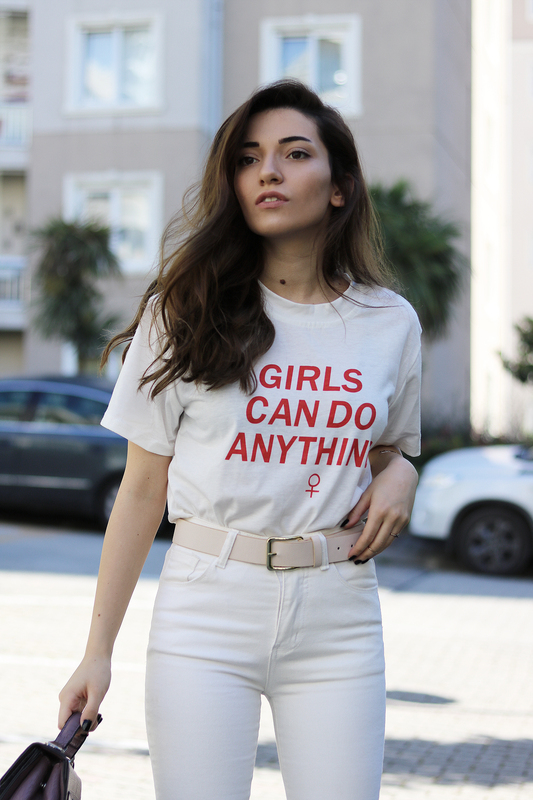 I don’t remember the number of times I’ve talked about but I’m so happy to call myself as a modern day feminist who believes in equality of sexes. While this outfit is my perfect summer look for city I’m shopping for my summer holiday right now. Since I spend most of the summer in the city all I have are jeans and t-shirts. So I need to shop for some light dresses and cami tops immediately. So be ready for ultimate summer looks guys! Today I’m sharing a very special post about self-gifting with charming Soufeel jeweleries. I love the idea of personalized jewelery, it’s a great way to express your feelings and important things and memories of yours. I believe it’s something amazing to invest in. I also have a tattoo on my wrist of my husband’s name so you can tell that I love having symbols of the things which have special meanings for me. There are so many jewelery options that you can personalize on Soufeel from necklaces to bracelets. 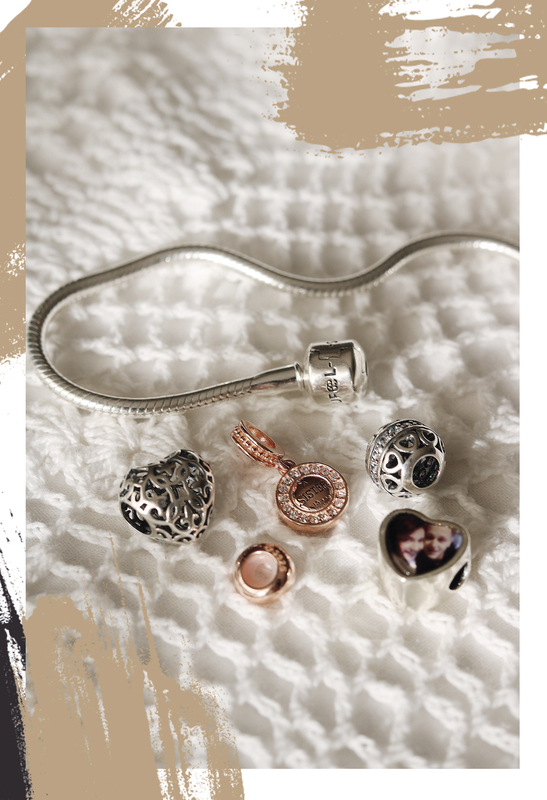 I picked the classic silver basic bracelet with five charms to tell my story. There are also rosegold and gold versions available as well as bangle bracelet. 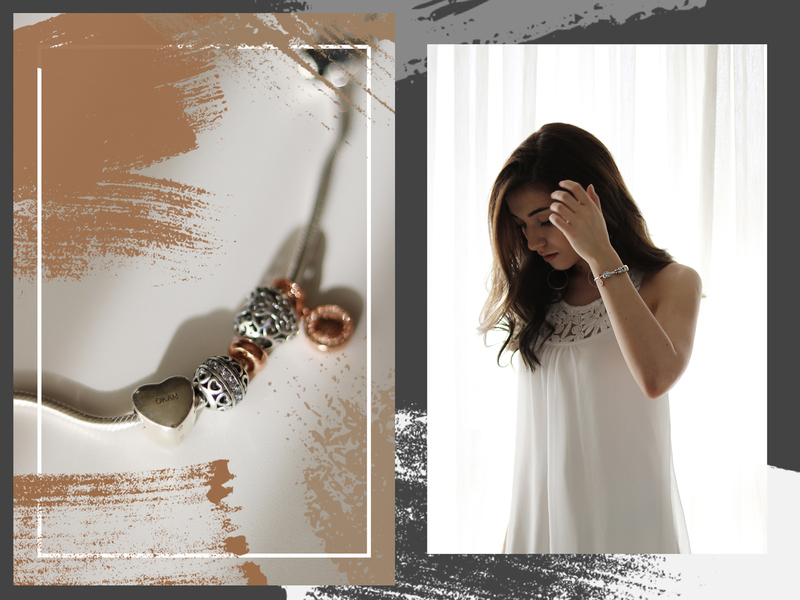 I decided to design a silver bracelet with rosegold details I’m so happy with the final result. Before detailing the charms let me talk about the order process and shipping. Since I’ve purchased an engravable heart silver photo charm it takes a little bit longer than the usual until it’s produced. So after I purchased my bracelet and charms that I want it took one month to recieve it. I receieved it via my local postal office. The parcel comes in a special box in a velvet pouch and there’s also a 925 Sterling Silver Certificate card in the box. For the charms I have four charms and one stopper on my bracelet. I wanted to carry the most important symbols on my wrist but also I wanted to have a clear minimal design. For the first charm I picked the “A Sister is A Forever Friend” charm in rosegol. You may already know that I’m very close with my sister, aka my photographer. She is my closest friend and one of my favorite human beings. I’ve already mentioned my feelings many many times about how it’s important to have a sister that you can truly trust and share your most special moments. As for the second charm I wanted to have something about Okan, my husband, so I picked the heart shaped photo charm. It has our photo (it’s one of the oldest photos of us, approximately 6 years old) on one side and Okan’s name on the other side. This is one is a very unique and it’s amazing to know that you’re the only one who has this jewelery on the planet. For the other two charms I prefered April Birthstone since I born in April but also I love it’s simple design and clear diamonds. To have the negative of heart shaped charm I picked this beautiful heart charm. For the last one I picked one stopper in rosegold to match with the sister charm. I’ve designed and purchased the bracelet to reward myself however it’d be also an amazing gift for your loved ones. Especially since it’s almost wedding season and a personalized jewelery is the wedding perfect gift for your friends and family.